Wensleydale lies within the Yorkshire Dales National Park and the River Ure runs through the valley for 74 miles from its source at Ure Head on Abbotside Common in the Pennines into the River Ouse at Cuddy Shaw Reach near Linton-on-Ouse, North Yorkshire where the river changes its name to the River Ouse. Wensleydale is perfect walking country with many way marked footpaths and open landscapes giving spectacular scenery all year round. Wensleydale is also renowned for hill farming, rearing many types of Sheep and cattle and the meadow grass for hay and silage is vital to the system. Its industrial past was water powered mills at Gayle, Hawes, Bainbridge, Askrigg, Thoralby, West Burton and Aysgarth which were variously used to grind corn, produce textiles (wool, cotton, linen, silk and flax), generate electricity or saw wood. 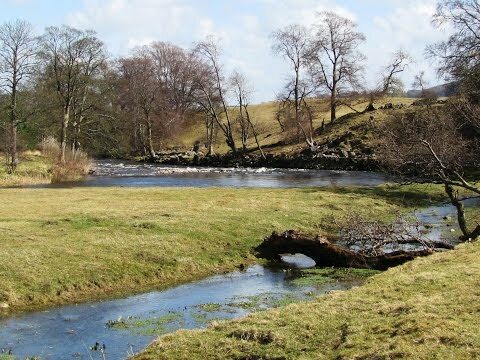 The River Ure is a typical clean river of the Yorkshire Dales National Park and is rich in wildlife, insect life and many species of birds. Fishermen love this river for its brown trout, grayling and it also has the nationally rare native white-clawed crayfish. West Witton just within the Yorkshire Dales National Park looks down onto the River Ure and has wonderful views of the valley. Penhill the prominent concave shaped hill above West Witton was formed during the last ice age when glaciers carved the valley into a U-shape. The beacon on the summit, built to warn of a Spanish invasion, is accessible by bridleway or by foot over open access land. This small village houses a shop and two pubs the Wensleydale Heifer and the Fox and Hounds. The Wensleydale Heifer is rather an unusual pub with luxury themed en-suite rooms and a quality restaurant specialising in seafood, it is well worth a visit. The Old Star once a 17th century coaching inn is now a family run B&B. The village is famous locally for its “Burning of Bartle” where a larger than life effigy of “Bartle” complete with glowing eyes is paraded around the village accompanied by repeated chants of the Bartle doggerel before finally being burnt at Grassgill End to the singing and cheers of the assembled crowd. The Doggerel being “On Penhill Crags he tore his rags, Hunters Thorn he blew his horn, Capplebank Stee happened a misfortune and brak’ his knee, Grisgill Beck he brak’ his neck, Wadhams End he couldn’t fend, Grassgill End we’ll mak’ his end. Shout, lads, Shout. This ancient ritual takes place on the Saturday night closest to St. Bartholomew’s Day on the 24th August. The Witton Fell race takes place the day before and the Witton Feast, a fun day with lots of activities and things going on, takes place the day after. The Burning of Bartle Trail, developed in 2005, is a 4 mile walk around the village marked by a series of mosaics embedded in the stone walls, each created by children and adults from the village. The original church of St .Bartholomew dates back to Saxon times and went under major restoration in 1875 leaving only the Saxon north wall and 16th century bell tower. During the restoration a Saxon carved stone cross was uncovered in the church wall, which is now displayed above the pulpit. The old vicarage, a Grade II listed building parts of which date back 300 years, is now a B&B. Kagram is a very small hamlet adjacent to West Witton. The Penhill Preceptory of the Knights Templar is the remains of the walls and graves uncovered in 1840, belonging to the chapel built in 1200. Redmire Force, situated on the River Ure, is a series of small but beautiful waterfalls only a few miles from the more popular Aysgarth Falls. Bolton Castle on the other side of the valley, built between 1378 and 1399, is one of the country’s best preserved medieval castles. It is a Graded I listed building and a Scheduled Ancient Monument. The castle has never been sold and is still privately owned by the eighth Lord Bolton who is a direct descendant of the castle’s original owner Sir Richard le Scrope. The castle provides historic tours where you will find a raft of sights, sounds and smells which bring the castle to life. It also caters for family days out and educational trips. The nearby village Castle Bolton takes its name from the castle. We park in the lay-by just on the edge of West Witton and walk into the village for a quick look round before taking the little road sign posted Melmerby 2½ Carlton 3. We walk uphill and turn right at the footpath sign for Kagram and follow the hedged track to a gate. We head forwards through the gate and over two fields then at the footpath sign we turn left following the hedge on our left towards the wood. We go through the stile in the wall in the corner of the field and turn right uphill. At the top we go straight forward through the gated stile and follow the wall on our right towards a caravan park. We make our way down some steps into the caravan site and follow the tarmac road for a short way and turn right down a narrow little fenced alleyway next to a red dog bin. We walk forwards then head downhill, with Kagram down below, through the wood to the road. We turn left following the road uphill to the bend then head straight forwards at the footpath sign for Templars Church 1½ along Langthwaite Lane. At the end of the lane we go through the stile in the wall on the right then turn left and head forwards following the wall on our left. We go through an open gateway and across the next field to go through a gate. We then head downhill slightly left to meet a bend in a concrete track. We keep heading forwards following the footpath sign to go through a gate and keep heading downhill to the Knights Templars. We then go through the gated stile in the corner and turn right downhill on the track towards the folly to the left of Templars Farm we can see in front of us. We turn left onto the road downhill and after passing the road sign for West Burton and Kettlewell we turn right at the footpath sign for Slapeston Wath ½ and head forwards. We cross over a cattle grid and follow the track keeping to the wall on our right until we come to the River Ure. We turn right through the gate and follow the path uphill through some trees for a short way. At the top we follow the grass marked path with the river on our left through the fields going over the stiles until we go through a gate at some trees leading downhill to Redmire Force. We head forwards on the path through the trees then through the fields following the course of the river until we come to a footpath sign. We turn right for West Witton and head for the two yellow topped posts and then to the right of a farm in the distance. With the farm on our left we go through the gate over a little stream and turn right to follow the farm track. We keep heading forwards and when the track bears left then splits into two near the church we take the track to the left back to the road at West Witton. This is a moderate walk on well marked grass and stony paths, tracks and bridleways with gates and stiles. There is one short section of main road and some moderate inclines and declines. Elevation: Approx lowest point 119 m (391 ft), approx highest point 269 m (882 ft). Approx 6.5 miles allow 2 hours 30 minutes using OS map OL30 Northern and Central areas. Wensleydale, Swaledale. Start Point: lay-by on the A684 just on the east side of West Witton. West Witton is situated on the A684 between Layburn and Aysgarth in Wensleydale in the Yorkshire Dales. From the A1 take the A684 to Bedale. At the cross roads turn right still on the A684 to Layburn. Turn left at the roundabout still on the A684 through Wensley and West Witton is approx another 2 miles. There are no public toilets. For refreshments there is a shop and two pubs the Fox and Hounds and the Wensleydale Heifer.